Spirit and Dust by Rosemary Clement-Moore. Delacorte Press, 2013. Currently Available. Face Value: I can be on board with the Hitchcock reference, and the shadowy figure in the eye is appropriately stylistically creepy in keeping with the style of the book. I think that this cover kind of looks like a campy movie poster for a thriller, which works. It’s not necessarily a piece of artwork I’d want to frame and put up on my wall, but it will definitely suffice as cover art for this piece of fiction. Does it Break the Slate? I definitely thought so. Daisy is a smart, tough, and dynamic character who uses her intelligence and skills to solve crimes and save people, rather than wait helplessly to be saved. Carson is a terrific foil to her character, with a multilayered characterization that goes beyond “mysterious love interest.” There is an overall respect for Daisy’s abilities across characters in the book. To a certain extent though, I have to offer up a wish for another excellent female character, alongside Daisy. She’s fabulous, and definitely a Slatebreaker, but there is an element of “Extraordinary Girl Syndrome,” where she is a lone awesome girl surrounded by men. Hopefully in future books we’ll get more action from the rest of the Goodnight women though, who all seem to have a lot of Slatebreaking potential. Who would we give it to? There are lot of people who liked Dan Brown’s The DaVinci Code, right? So imagine being able to offer those fans a book that has intrigue and research and running through museums as you escape from the bad guys and try to figure out an old secret, but features a snarky goth teenager as our protagonist instead of an improbably resilient professor and has no instances of using italics to denote internal monologue? 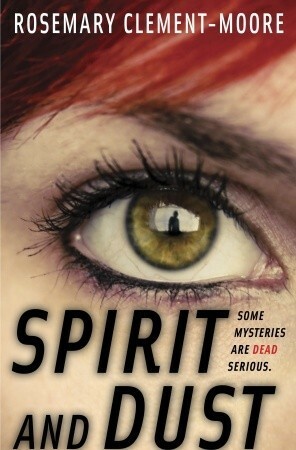 What I’m saying is, Spirit and Dust is a really fun research-based thriller with great characters and a satisfying mystery that gets rolled out, without the lame parts of a Dan Brown novel. There’s definitely an audience for that. Also the adventure comes together with a battle in the Field Museum in Chicago. Review: Daisy Goodnight can speak to the dead. But unlike many books with this plot element, there’s no scene of discovery or crazy accident that leads to this ability. She’s always had it, just like many of her family members. And so, as a college freshman, she’s honed this skill enough that she’s frequently enlisted by the FBI for her help in solving crimes. But when she’s flown to Minnesota to investigate a murder/kidnapping, she finds herself in the midst of something much bigger than any crime she’s investigated before. Kidnapped by a crime boss who uses magic in dangerous ways, Daisy finds herself on the run with a handsome intern with his own magical talent, trying to solve an ancient mystery while searching for contemporary truths. There’s a terrific readability with this book, as any good crime novel should have. And Clement-Moore does a great job of balancing some of the tropes of the genre (and a ton of pop-culture references) with an original story. I loved that we avoided long chapters of disbelief and exposition (the kind of thing where a character, as audience stand-in, has to figure out and come to terms with the mystical happenings in the world), but instead enter a world where the existence of psychics and magic are a known fact. This gives Daisy a new level of power, because she doesn’t have to fight against a “crazy woman who believes in ghosts” stereotype. It also lets us jump right into the action. As a reader, I really enjoyed seeing the relationship that develops between Daisy and Carson. It was obvious from the beginning, nothing crazy original here, but it was well crafted and built on mutual respect and chemistry. So – enjoyable and satisfying, with just enough surprise twists to keep the story interesting. Both characters are smart and witty and the expected journey from enemies to friends to more-than-friends is believable. Though mysteries and thrillers aren’t really my genre, adding the element of research always increases my level of enjoyment . So watching Daisy and Carson travel from museum to museum and unearthing ancient secrets is fun. Plus, as a former Chicagoan, seeing Sue the dinosaur at the Field play a major role in the resolution was an exciting bonus. This entry was posted in Reviews, Young Adult and tagged Ghosts, Intrigue, Murder, Museums, Mystery, Psychics, Thriller. Bookmark the permalink.